The Scottish and English may be very similar in their approach to heraldry, however there are many subtle differences. Scottish heraldry has a simplicity and an openness to it that the British could learn from. For example in English heraldry you can add as many coat of arms as will fit to include all family parts. In Scottish heraldry, you can only have five parts to show on your coat of arms. So you have to get rid of what’s not important. Simplicity. In England, the blood related family members could use a variation of a coat of arms. However in Scotland, the use of a coat of arms was through the clan, who may be quite distantly related or possibly not even blood related. Such an open system when you compare it to the English system. Scottish clans became a “family” and incorporated large areas of people who took on the clan name. So this meant that people in a town may all share the same “surname” if they have taken on the clan name, but they may not be blood related. In relation to Scottish heraldry, a single person is granted a coat of arms and is allowed to use it; this was usually the chief of a clan. However for future generations, the “original” coat of arms could be varied. This means that there is a core amount of coat of arms, with numerous variations through the generations. This system may seem complex but it actually makes the system more simple and easier to maintain the original medieval designs. In England, surnames were only used by the gentry and not by common people. This means there was less widespread use of a surname or clan name. So there are numerous coat of arms for the many surnames that eventuated. 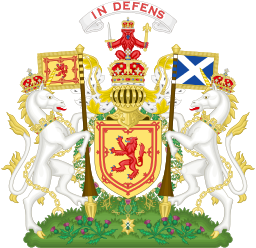 You know that the unicorn was chosen as the animal to represent Scotland on the royal coat of arms. I can see why that is fitting, the unicorn has strength while also having such purity and magic in it. The unicorn may be a mythical creature but it has been part of Scottish writing since the 12th Century. It was even used on coins around 1466. So I wish you good luck searching for your Scottish inheritance; you may need to have a unicorn on your side, to give you the strength to keep searching and magic to make it happen. Last updated by Nicol Warren at July 13, 2015 . Coat of Arms, Scottish ancestry, Scottish coat of arms. Bookmark.